Hello Canada, and curling fans in the United States and Newfoundland. It's my pleasure to welcome to the podcast all the shut-ins, the pensioners, the blind, and all of those people who can't get out to watch curling games... Curling games? Okay, I've been exposed. I don't know curling from hockey, but I do know they both take place on the ice. And you don't "play" curling; you just do it. After talking to comedian (and curler) John Cullen for an hour, I know more about curling than ever before. I always figured because of my expertise in Wii curling, I'd just need six weeks training before I'm competing nationally in curling. But he insists that's not the case. Whatever. The episode isn't all curling, though. We also talk comedy, magic, give a review of the Bill Burr show we went to that very night, discuss pedagogy (John's also an in-demand substitute teacher, or TOC to use the lingo du jour), bad first dates, and embarrassing high school poetry. Plus we're joined in studio by fellow teacher and curling fan Jack Showers to translate stuff to me in language I'd understand. Stream the episode below or go download it at Stitcher, PodcastLand or wait who knows how long for iTunes to get around to putting it up. It'll get there eventually. Are you ready to rock?! You better be because we've got Mounties on this very special podcast episode. You know, the rock band. The super-group. All three members are present and accounted for. 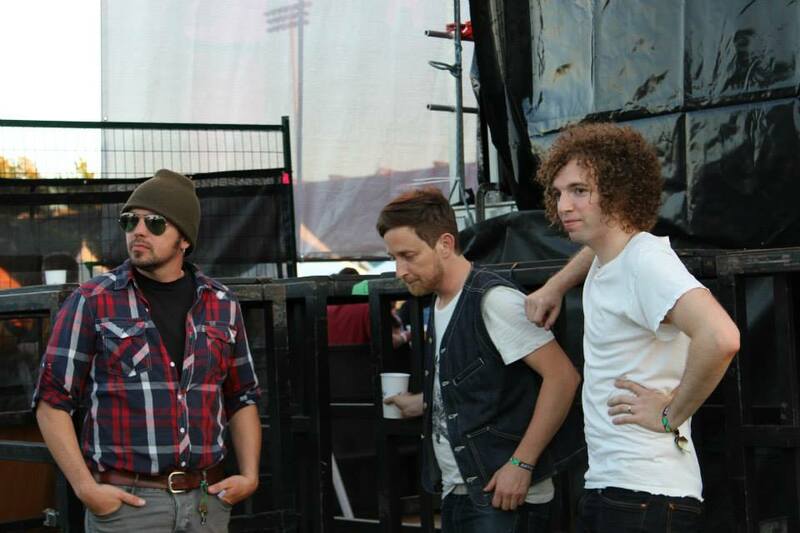 Prior to their first ever Canadian tour (or tour anywhere), Hawksley Workman, Ryan Dahle, and Steve Bays stopped by the What's So Funny? studios for close to two hours. Gollywonkers, that's a long one. Sure, maybe it's a tad self-indulgent, but there are three of them. At 1 hour 48 minutes, that works out to a mere 36 minutes per Mountie. It's not all music talk, don't you worry. No questions about musical influences or how they met. Rather it's a wide-ranging (read: all over the map) talk about things like Steve Bays' pet rabbit, Ryan Dahle's favourite teacher, and Hawksley Workman's favourite sitcom. We also gabbed about funny dads (they all have one, it turns out), memorizing Jerry Seinfeld routines, how merch takes the fun out of the music business, how boogie-woogie music makes you cool, and growing up in the 1940s. We also find out which Mountie isn't a big fan of Hall & Oates. If you haven't already, go buy Mounties' album Thrash Rock Legacy. It's on iTunes. I bought it and love it. That's a high compliment because I know my rock'n'roll... It's still called rock'n'roll, isn't it? And while you're at it, go back and get some Hot Hot Heat, Fur Trade, Limblifter, Age of Electric, or any of Hawksley's previous incarnations. They're all the bee's knees, as the kids are saying. Get started right here by clicking below. Or go to all the usual podcast outlets to download the episode. You know, Stitcher, PodcastLand, iTunes, et. al. We've got some catching up to do so let's get to it. In this episode, newlyweds Shauna Johannesen and James Danderfer talk about creating a movie musical in eight days. They were one of six teams that were part of the Crazy8s film making challenge. And their baby, Bed Bugs: A Musical Love Story is a winner. In this episode, we learn about the specific challenges they faced and we hear all four songs from their 15-minute musical. Trust me, you'll be humming them for days after listening to this. Check it out. You can listen to the whole thing right here, or check out iTunes (which is notoriously late but it'll be there in time, don't you worry), Stitcher or the always reliable PodcastLand. In this episode, Montreal native Kwasi Thomas joined us for the first time. We talked about all sorts of stuff, like being a black man in BC, what he misses and doesn't miss about his hometown, the beauty and grandeur of Trinidad, performing drunk, and why he loves Celine Dion unconditionally and unironically. We also play a track from one of his main comedic influences, homeboy David Pryde. All you need to do to make this happen for you right now is click below. Alternatively, you could download it at Stitcher, PodcastLand or iTunes. We've got it covered. It's sweeps week on Co-op radio. Not in the broadcasting sense, since Co-op radio is above such base considerations as listenership. I mean in the curling sense. Our guest tonight is John Cullen: comedian, teacher, and curler. As a comic, Cullen recently played to a sold-out Vogue audience as the warm-up to stunt magician Wes Barker. As a curler, he hosts the popular (in the curling world) video series Cullen and a Curler. He's also pretty adept at the sport, too. He's been a curler on the World Curling Tour for the last eight years, he won a bronze medal in the 2012 BC Men's Provincials, has appeared in four straight provincial tournaments, and was ranked 25th on the World Curling Tour money list in 2012. And as a teacher, he was able to join us so late on a school night because it's March break. He's also a bit of a drummer and was named one of Vancouver's most eligible bachelors by the Province newspaper. So we've got lots to talk about, even though I know nothing about curling. We get things started at 11 pm PT on CFRO, 100.5 FM in Vancouver. But curling fans the world over can livestream the show at coopradio.org. From left, Workman, Dahle, Bays. As its name would imply, What's So Funny? usually draws its guests from the vast world of comedy. Occasionally, though, I like to throw a bone to a young up-and-coming band struggling to make its way in the world of show business. I think of it as giving back to the community. So when the fledgling group Mounties approached me and begged to be on the show, I welcomed them with open arms. Regular listeners of the show will be familiar with Steve Bays, who's been with us four previous times. Steve sometimes warbles with bands such as Fur Trade and the redundantly named Hot Hot Heat. Tonight he brings along two other boys with him: Ryan Dahle has dabbled in music with the bands Age of Electric and Limblifter; and Hawksley Workman, known for his work with Hawksley Workman (obviously he doesn't play well with others). Together the three lads have formed what is apparently known in the business as a "supergroup." I'll ask them what that means but presumably their costumes involve capes and masks – rock and roll isn't really my area of expertise. But I bought and paid for with my own hard-earned cash the new Mounties album just released this past week called Thrash Rock Legacy and I must say it's quite catchy. I highly recommend it. Don't let the title fool you. These boys have a lot of talent; they're not just out there thrashing around like animals. So tune in tonight for all the fun and frivolity that only three musicians can bring you. We're on the air at 11 pm and will go until it ends, whenever that may be. Tune in to CFRO, Vancouver Co-op radio, 100.5 FM. If you're from far away, livestream us at coopradio.org. And of course we'll drop it as a podcast episode when I get around to it. Go download their album first to prime you. And check them out at a venue near you. They're going on tour in ten days once they learn all their songs and choreography. I will be in the front row at the Commodore when they play there on March 21 enjoying the mosh pit. by the What's So Funny? studios. Last time she was on the show, I got a front row seat and private show for her cheeky and filthy songs. Not only are they funny, but she's such a good singer. But alas I couldn't make it in. Thankfully Dino Archie was able to guest host in a pinch. He says it was his first time, but that's not quite right. He once spent an episode interviewing me. I let him have full reigns. So I knew he could do it. This is a fun episode. I listened to it. Not at the time, of course, because I was sick. But I heard it. They had great chemistry, although it might very well have been the alcohol. See if you agree. They talked about creepy fans, her recent foray into the Edinburgh Fringe, and they got in plenty o' slags at me. But why not? I can take it. And of course Shirley sings a couple of ditties. Check it out. You can also find it on iTunes (eventually), Stitcher (now), and PodcastLand (now). It's Oscar night so we have two filmmakers in studio with us. Last night, Shauna Johannesen and James Danderfer, both former WSF? guests on their own, premiered their 15-minute short film at the Crazy8s Gala at the Centre in Vancouver for Performing Arts. Over 1000 people roared their approval for Bedbugs: A Musical Love Story. I loved it. So fun and funny and bright. James Danderfer conceived it, Shauna Johannesen birthed (wrote) it, James composed the music, Shauna starred in it, and they both produced it. (It also co-starred 3-time What's So Funny? guest Toby Hargrave.) You might know Shauna as the "Shut the front door!" reporter on the A&W commercials; James, of course, is a jazz clarinetist extraordinaire with many CDs to his name. We'll get all the details tonight about the Crazy8s process, what it's like working together as husband and wife, and where they go from here. Maybe we'll see them at the Oscars one day. Tune in tonight to CFRO, Vancouver Co-op radio, 100.5 FM at 11pm to midnight. If you're out of earshot, you can always livestream us at coopradio.org.